The first time you hear a Christmas tune playing as the year is ending, you might hum or even burst into song; however, when it’s the beginning of December and you’re already sick and tired of anything related to Mariah Carey, then there’s a problem. It seems that at least half the population of the U.S. believes that the holidays skip straight from Halloween to Christmas, but there is one blissful day they all seem to forget. Possibly even you have forgotten. It’s American-made and full of gluttony that will have you incapacitated for the next three days unless you are throwing down over some towels on Black Friday. 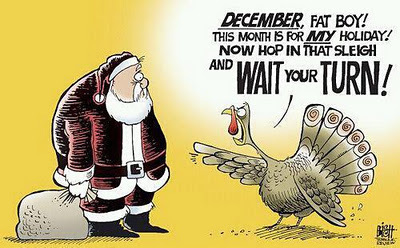 In case you’ve forgotten, it’s Thanksgiving! There’s food everywhere, and it’s the day where nobody has anything to say because it’s expected of you to eat until you need to loosen your pants. But when people jump to Christmas and start putting up the tree and lights right after the fake webs and spiders are taken down, then the focus is no longer put on preparing that huge Thanksgiving feast and being around family. Not to mention, you’re going to have those Christmas decorations up for two months! I don’t care if you say you’re a Christmas fanatic, after enough time, those twinkling lights that you thought would never get old become super tacky, and you eventually feel like burning a forest of pine trees because of the sheer sight of them. I get it, Christmas is a great holiday full of cheer and presents and family and sweets, but just save it until December. People need time to enjoy Thanksgiving and the celebration of food being shared between Native Americans and Pilgrims, which actually never happened, but let’s just pretend that we didn’t kill thousands of Amerindians with disease; that we all got along perfectly for this one day. So keep your Christmas tree and Santa window clings in the attic for another month, and enjoy your Thanksgiving feast before you fall into the deep dark hole of never-ending Hallmark Christmas movies.